KE00018 is a solid phase sandwich Enzyme Linked-Immuno-Sorbent Assay (Sandwich ELISA). 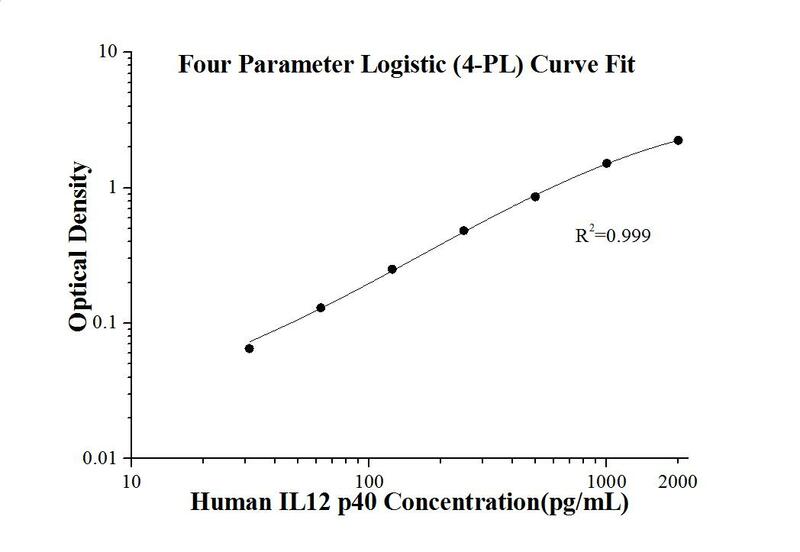 The IL12 p40 ELISA kit is to be used to detect and quantify protein levels of endogenous IL12 p40. The assay recognizes human IL12 p40. A polyclonal antibody specific for IL12 p40 has been pre-coated onto the microwells. The IL12 p40 protein in samples is captured by the coated antibody after incubation. Following extensive washing, a monoclonal antibody specific for IL12 p40 is added to detect the captured IL12 p40 protein. For signal development, horseradish peroxidase (HRP)-conjugated antibody is added, followed by Tetramethyl-benzidine (TMB) reagent. Solution containing sulfuric acid is used to stop color development and the color intensity which is proportional to the quantity of bound protein is measurable at 450nm. Interleukin-12 (IL-12), is a cytokine that is secreted by activated phagocytes and dendritic cells and that induces interferon-γproduction by natural-killer and T lymphocytes. IL-12 is a 75 kDa heterodimer composed of a 35 kDa subunit (IL-12A p35) and a 40 kDa subunit (IL-12B p40) that is secreted by a wide variety of antigen presenting cells (APCs), including phagocytes, B cells and Langerhans cells. IL-12 p40 has been found to be important for sustaining a sufficient number of memory/effector Th1 cells to mediate long-term protection to an intracellular pathogen. Overexpression of IL-12 p40 was observed in the central nervous system of patients with multiple sclerosis (MS), suggesting a role of this cytokine in the pathogenesis of the disease. The promoter polymorphism of IL-12 p40 has been reported to be associated with the severity of atopic and non-atopic asthma in children.